Gerry: Rouault described himself as “a Gothic artist… Preoccupied with sinister backgrounds and besetting sins,” which abound in both the Van Eyck and Pye pieces. I saw that altarpiece years ago, and it surfaced to my consciousness when I saw the Pye triptych. Lisa: I’ve read that Rouault cited the Matthias Grünewald altarpiece as his reference. The Pye installation is a three-part altarpiece similar to the Grünewald Isenheim Altarpiece (1506-1515), as well. I’m pleased you were able to relate your memories to the piece. Gerry: Is the Graz landscape in the distance of the side panels from a painting? Lisa: It was filmed when the Pyes were on a study grant there last year. I was just there myself a few weeks ago. It was a sunny day, so I was not aware of the brooding view captured in the video. Gerry: I interpret Rouault’s Tragic Landscape as a crucifixion scene, but I haven’t been able to find anything that confirms that. From certain angles, I think I see three crosses. Lisa: Rouault was once quoted as saying, “My life is back in the age of cathedrals.” He was a deeply religious man, so your interpretation could be correct. 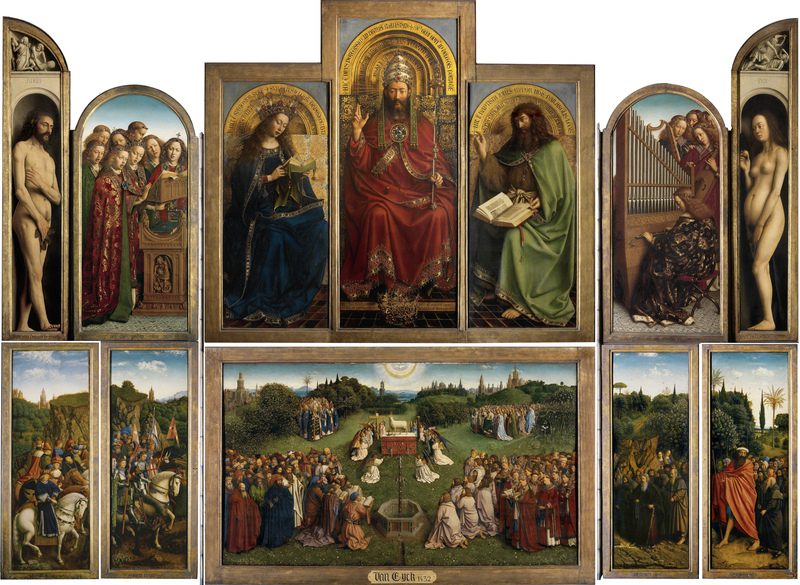 Gerry: The Van Eyck altarpiece shows Adam and Eve in poses nearly identical to those in the Pye piece. I am familiar with the Grünewald crucifixion scene, not in the altarpiece, but in a small copy (by Grünewald) that’s in the National Gallery of Art. I looked at some of the several Adam and Eve paintings by Grünewald online. There are interesting subtle variations in the different versions, which I interpret as different takes on the male/female relationship in the biblical story of man’s fall from grace – is the culpability hers, his, or shared? Nicholas and Sheila Pye, detail from The Coronoation, 3-channel video/still 2008. Courtesy of the Curator's Office and Nicholas and Sheila Pye. Lisa: I think you might be on the right path, Gerry. The fruit in question is a lime; I asked Nicholas Pye when he was here. Gerry: I’ve become fascinated by the “intersections” between these two works, the Pyes and the Rouault, which I guess is what this project is intended to provoke!